Go Collyer’s, representing the UK in the global olympics of robotics! As I write this, events are getting underway at the 2017 FIRST Global Challenge – a yearly international robotics tournament pitting teams of high-school students against each other in friendly competition. This year, students from almost 160 countries have descended on Washington, DC for an Olympic-style event, themed around solving the global water crisis. At FIRST Global, the UK is represented by a team of young roboticists from the College of Richard Collyer (Collyer’s), in Horsham. That’s pretty exciting for Red River, as we’ve got close ties with the college through the IT Degree Apprenticeship programme that we offer in conjunction with the University of Chichester. Adam and myself are ex-pupils of Collyer’s, as are Luke and Dylan who’ll be joining us soon as next year’s apprentices. While at Collyer’s, I led the development side of the robotic club, and I’ve remained in touch with this year’s team. 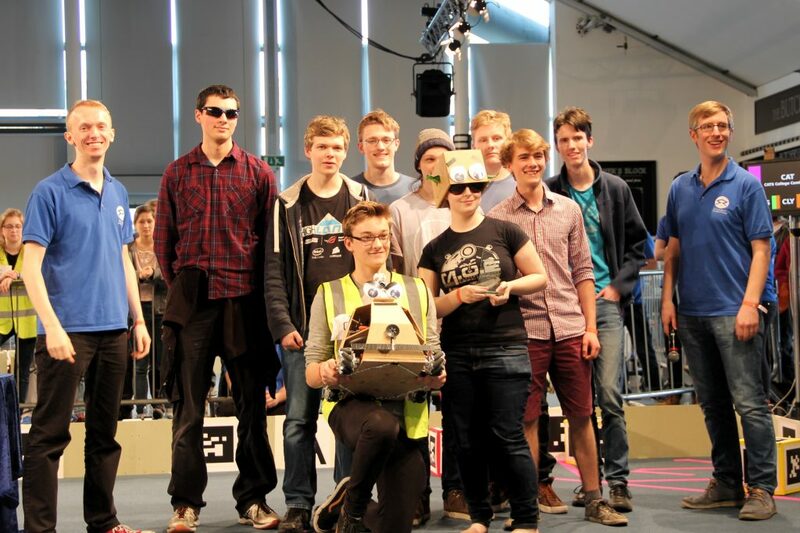 For Collyer’s to represent the UK, they first had to become finalists in the UK’s Student Robotics competition. I was the team’s mentor for that, although to be fair with an immense level of talent in both programming and design, they didn’t need much from me – I mostly helped answer a few queries and passed on information from Student Robotics. Collyer’s went on to finish third – the college’s best ever result. Collyer’s win third place at the Student Robotics competition. Photo by Richard Barlow/Flickr, Creative Commons. After the SR competition, Collyer’s had two weeks to submit their presentation to Student Robotics, who were thoroughly impressed by the rapid prototyping they had achieved and awarded them the chance to represent the UK at FIRST Global. Since then, Red River has sponsored the team, helping them to purchase materials to create a replica of the FIRST Global arena – providing them with the valuable opportunity to test their robot under game conditions before arriving in Washington. You can see more of the Collyer’s robot in action on the Collyer’s Robotics YouTube channel. It’s impressive, particularly given that they had to build it between A and AS level exams – sometimes even arriving at college early to work on the robot, taking an exam, then returning to the robot! We’re all rooting for Collyer’s in the Red River office. They’ve already won their first round, and have their second and third matches at 5.58pm and 10.36pm today (UK time) – you can keep up with the action yourself via the official FIRST Global live feed. And if you’d like to find out more about our partnership with Chichester University, watch the video below.